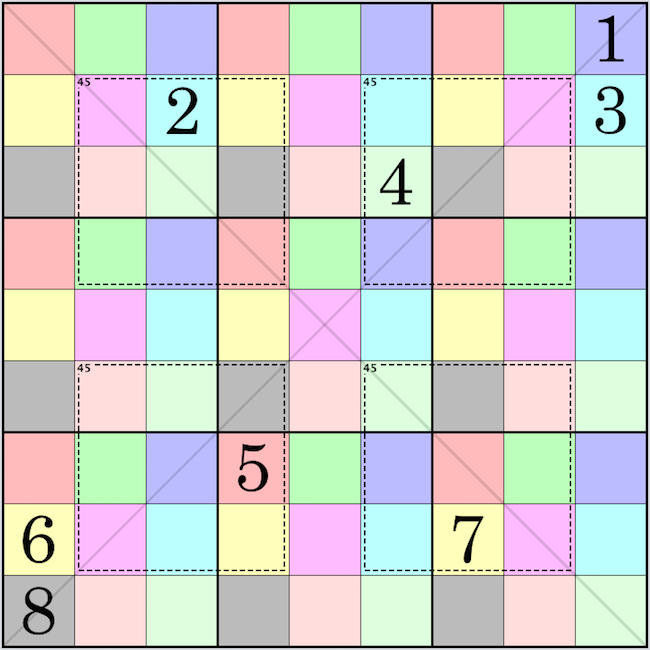 SudokuPW is fairly straight-foward, it's both a SudokuP puzzle and a SudokuW (Windoku) puzzle. Last edited by Mathimagics on Sat Dec 08, 2018 2:12 am, edited 1 time in total. Since there are 5 "houses" we have 45 constraints (9R + 9C + 9B + 9P + 9W), and 81 + 45 = 126, so adapting Mladen's 128-bit fsss2 solver is a simple task, and we have 2 spare bits so diagonal-mode (SudokuPWX) also fits (just!). I built my catalogs of ED grids for PW and PWX by finding all solutions from 1's templates, then canonicalising the results and removing duplicates. I had thought that no transform other than rotation/reflection would preserve both W and P properties, but discovered that in fact the "W" transform that blue identified (see here) does this, so we have 16 transforms all up (for both PW and PWX). My counts for the number of ED grids are 177,564 for PW, and just 2,922 for PWX. (Hopefully blue will do a quick "Burnside" check and confirm these counts). There appear to be loads of 8-clue PWX puzzles. 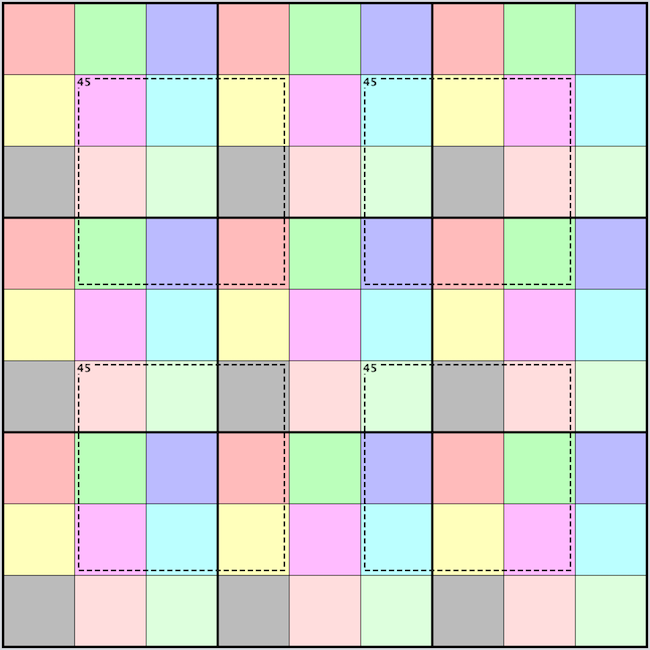 I've checked 360 grids so far (12%) and 160 of those grids have 8C puzzles, 4000 puzzles in total. with 45 known regions ... this one is certainly restrained. I already have a file of all symmetric 8 clue 9x9 puzzles. Last edited by tarek on Sun Dec 09, 2018 7:27 am, edited 1 time in total. This is clearly a matter of personal preference, it seems! I'm not a fan of 9-colour display formats. If you can't print it in B&W it's useless to me! PS: For PC display, you might use the colours to identify the W sets, thus all 9 would be (relatively) clear, not just the 4. An option chould be provided to switch the display between P-set and W-set colour modes. I actually prefer B&W myself. That is the reason behind trying to find alternatives in some of variants that would show on B&W/Newspapers. The issue for a shared image for me is that you need to know the constraints just by looking at the puzzle. The coloured DG groups with the 4 windows should suffice. I looked into several options of shading in the past to make it easier to print on B&W with poor results especially if you're planning on writing on top of them too. this is why DG puzzles were not as popular in newspaper prints. Last edited by tarek on Sat Dec 08, 2018 12:36 pm, edited 4 times in total. Mathimagics wrote: My counts for the number of ED grids are 177,564 for PW, and just 2,922 for PWX. Hmmm ... is this the very first time that I have got the transformation count (and hence ED) correct at the first attempt? Tarek's pair of symmetric 8-clue PWX puzzles gave me a minor scare. Both puzzles solve to the same CF grid, but when I checked the HS results for that grid, I found only 1 symmetric 8-clue puzzle. P = orig puzzle, S = solution, CS = CF solution, CP = CF puzzle. Now I've only completed the 8-clue enumeration for about 40% of the ED grids, but out of 16000 (!) 8-clue PWX puzzles found so far, this is the ONLY symmetric case. Direct enumeration of all symmetric 8-clue PWX puzzles is easy, since there are only 58905 possible patterns and only 1 clue-set per pattern (ie all clues must be different values). Note that for each item, we can produce up to 16 equivalent forms (by rotating, reflecting, and applying the magic "W" transformation). Last edited by Mathimagics on Sat Dec 08, 2018 7:56 pm, edited 2 times in total. I must take your word for it Mathmagics. I wouldn’t guess that my 2 puzzles were isomorphic by looking at them!! amazing!! We can use the same approach to find 9-clue symmetric puzzles, which are found from the same 58905 patterns (+ center cell), but with 37 clue-value variations (no pair match, one pair match) that need testing for each pattern. That is, we can have either 8 different clue values or 9. I haven't reduced these sets to remove equivalent CF puzzles, but I can do so if anyone is interested. Last edited by Mathimagics on Sat Dec 08, 2018 7:46 pm, edited 1 time in total. tarek wrote: I must take your word for it Mathimagics. I wouldn’t guess that my 2 puzzles were isomorphic by looking at them!! I think that is true for rotational symmetry .... with reflective symmetry you may find more! Thus, to enumerate 8-clue puzzles, I simply select all possible sets of 4 cells in the first 4 rows (58905 ways to pick 4 from 36), and complete each pattern by adding the 4 "opposite" cells. 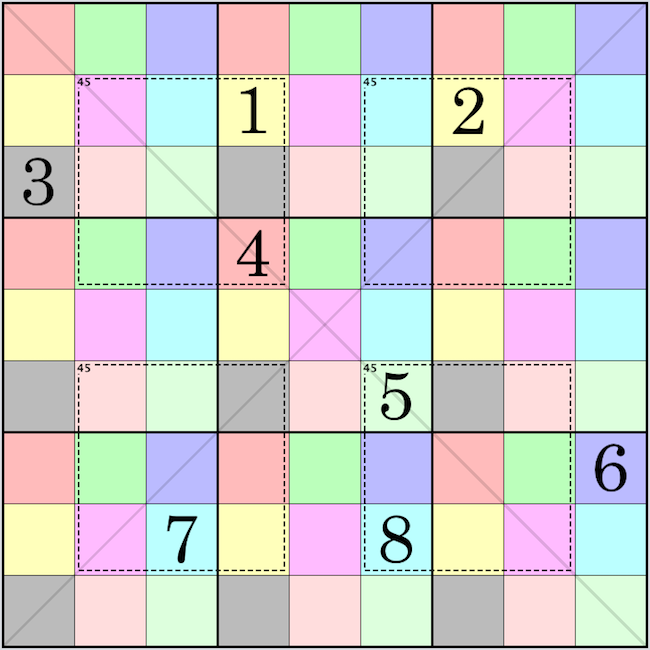 9-clue puzzle patterns are just the 8-clue patterns with cell (5, 5) added. For each pattern, we need to see whether any valid clue-value assignment gives a valid puzzle. For 8 clues we need only test one clue-value set (1 to 8), since we know clues must have at least 8 different values. For 9-clues we need to test the case of 9 different value, plus 36 cases where one pair of clues has the same value. Last edited by Mathimagics on Sun Dec 09, 2018 10:34 am, edited 1 time in total.